The capital city of Spain,Madrid, since 1562, is located at the geographic center of the Iberian Peninsula. 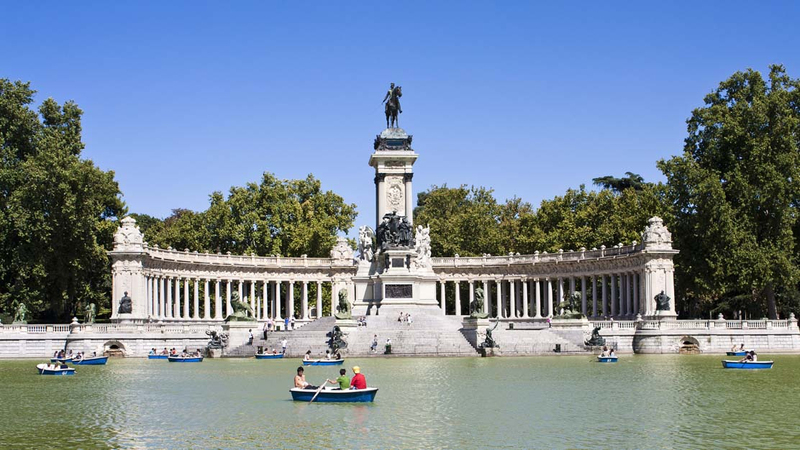 Spain’s central capital, is a city laced with boulevards and elaborate, manicured jardínes such as the Buen Retiro. 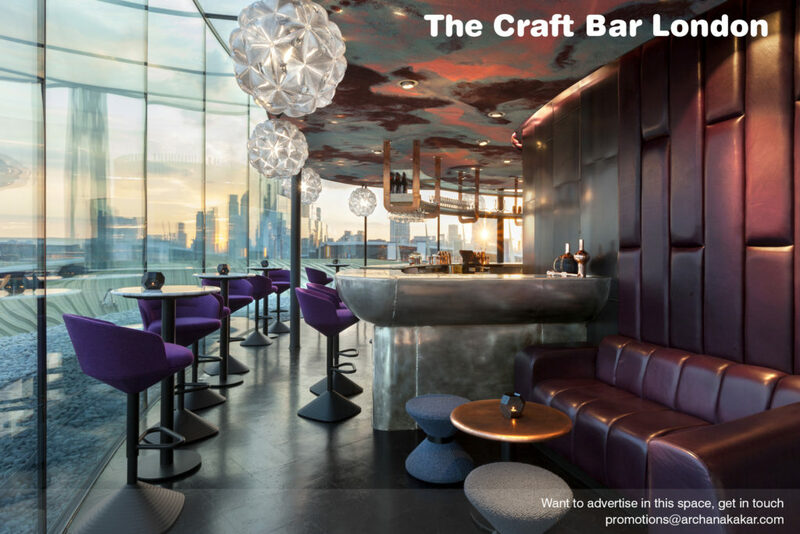 It’s acclaimed for its rich repositories of European Art well preserved, in the “Golden Triangle of Art”. 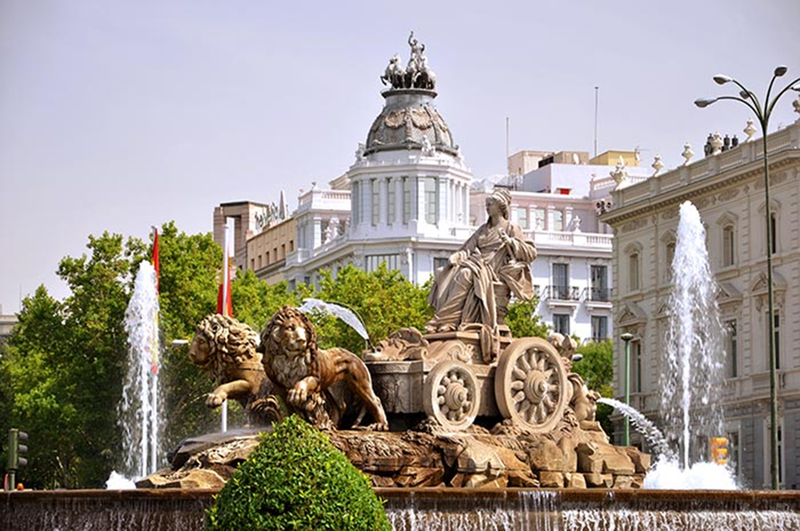 Located along the Paseo del Prado and comprising of three art museums: Prado Museum,that boasts of works by Goya, Velázquez and other Spanish masters.The Reina Sofía Museum, a museum of modern art, and the Thyssen-Bornemisza Museum.Cibeles Palace and Fountain become the monument symbol of the city. It is a visual treat to walk down the heart of old Hapsburg Madrid, the portico-flanked Plaza Mayor, and the baroque Royal Palace and Armory, displaying historic weaponry. The Plaza Mayor (English Main Square) is located only a few Spanish blocks away from another famous plaza, the Puerta del Sol. The Plaza Mayor is rectangular in shape, and is surrounded by three-story residential buildings having 237 balconies facing the Plaza. It has a total of nine entrance ways. The Casa de la Panadería (Bakery House), serving municipal and cultural functions, dominates the Plaza Mayor. One can enjoy a leisurely relaxed caña and a calamari under the awning of one of the various restaurants mushrooming inside or outside the square. Don’t miss buying a painting or a souvenir here. 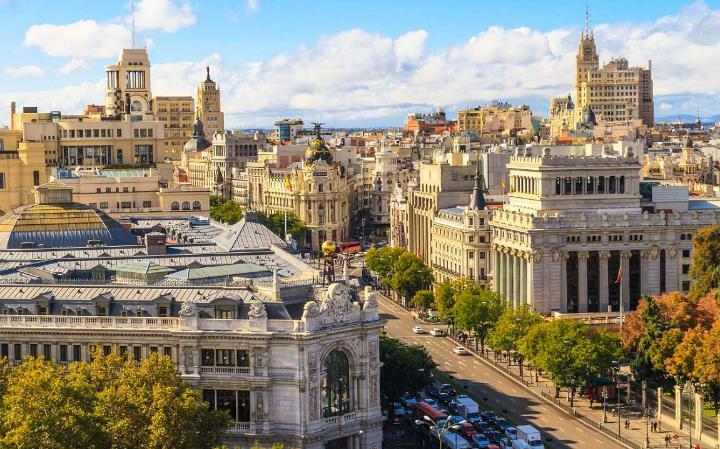 While Madrid possesses modern infrastructure, it has preserved the look and feel of, the old world charm with it’s historic neighbourhoods and calles (streets). snare at four in the morning, and the people you meet are not necessarily going off to work…. Spanish Cuisine- The long history of invasion is still evident in Spain’s cuisine. Olives, olive oil, and wine tie it closely to Greek and Roman (Italian) culture. Meat and fish pies show the Celtic heritage .The Moorish influence is seen in the use of honey, almonds, citrus fruits, and spices, such as cumin and saffron (a yellow spice).A leader in exploration and colonization, Spain incorporated in it’s cuisine the exotic treasures of the New World,such as Indian Spices, tomatoes, potatoes, sweet potatoes, beans, corn, peppers,chocolate, vanilla,all a native to the Americas .Your Spanish sojourn is incomplete without trying the exclusive and creative gastronomic delights,such as Tapas with a glass of Sangria or other innovative specialities as, Paella ,Croquetas,Patatas Bravas,Gazpacho,Empanadas,Jamón,Crema Catalana,Albondigas,San Jacobos,Pan Con Tomate,Mallorcan Tumbet and polishing it all off with Churros Con Chocolatebeneath centuries-old vaulted ceilings. Madrid is one city,you just feel like, walking and breathing in its sheer beauty of, “ Spanishness”. While in Madrid,do make a day trip to Toledo (Spanish: [toˈleðo]) 70 km south of Madrid. It was declared a World Heritage Site by UNESCO in 1986 for its extensive cultural and monumental heritage. Toledo is known as the “Imperial City”and “City of the Three Cultures”. No city on earth is more pulsating than Madrid, a beguiling place whose sheer energy carries a simple message: this city lives with you for the rest of your life.